The Mt Magnet gold project is located immediately adjacent to the town of Mt Magnet, 500km north-east of Perth in the Murchison Goldfield of the Western Australian Yilgarn Craton. 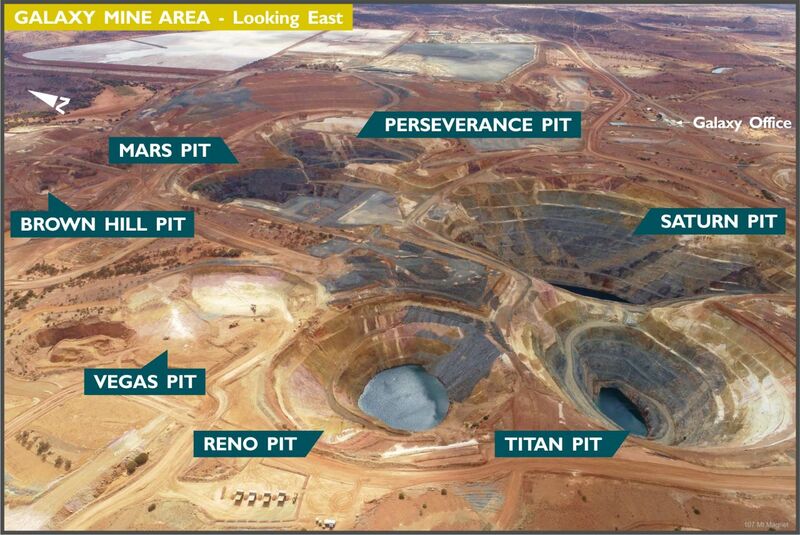 Ramelius acquired Mt Magnet Gold Pty Ltd in 2010 from Harmony Gold and restarted operations in late 2011. 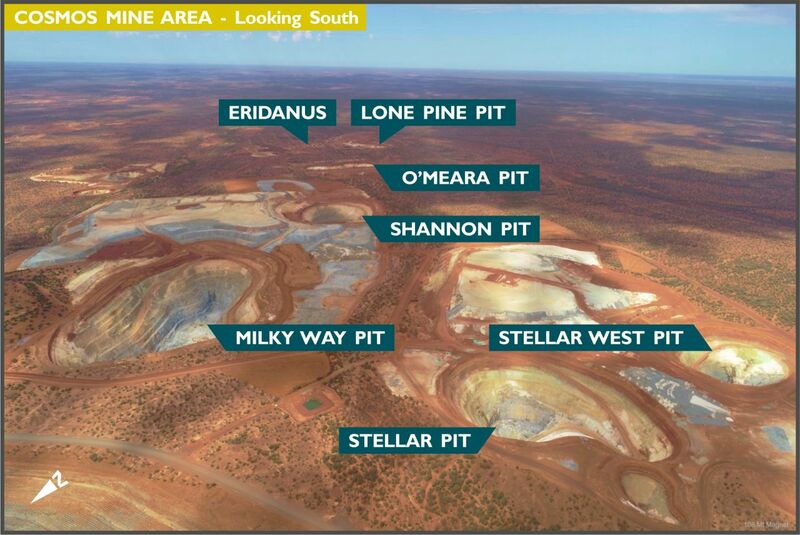 The Mount Magnet project consists of numerous open pit and underground mines plus exploration targets situated on established mining and prospecting leases. The total project area covers 225km². Historically Mt Magnet produced over 6 million ounces since discovery in 1891 and has significant potential to host new discoveries. The Hill 50 underground mine produced over 2.1 Moz of gold and was the largest gold producer in the field until the mine was closed in 2007. It had been mined to 1,500 m below surface, demonstrating the depth continuity of high grade mineralised shoots within the Mt Magnet project area. The Mt Magnet project is located within the north-south striking Meekatharra-Mt Magnet greenstone belt of the Western Australian Murchison Province. The greenstone belt lithologies comprise a succession of steeply dipping and intensely deformed plus interlayered mafic and ultramafic extrusive and intrusive rocks, felsic volcanics and banded iron formations (BIF). Granitic rocks intrude the greenstone belt stratigraphy. Banded iron formations are the dominant host rocks for gold mineralisation in the project. Gold mineralisation is typically associated the pyrite & pyrrhotite replacement of magnetite in the banded iron. High-grade ore shoots are developed along the intersection of the BIF and a swarm of northeast trending faults, colloquially referred to as Boogardie Breaks. Significant gold mineralisation is also found in porphyritic felsic units of the Boogardie Basin. Mineralisation generally occurs as a stockwork style of sericite-silica-pyrite veining and alteration within felsic porphyry units intruded into ultramafic flow sequences. Gold mineralisation tends to occur along felsic margins adjacent to the ultramafic contact. The Cosmos area consists of this style. From 2011 to 2017, Ramelius’ operations have consisted of large open pit cutbacks on the Galaxy mining area, consisting of a number of large open pit cutbacks. Mining operations employ leading contract mining companies, MACA Ltd in open pits and Byrnecut Australia for underground. From 2018, a series of new pits in the Cosmos mining area commenced. Milky Way is a large, low-grade, felsic hosted, stockwork deposit providing major mill feed. It is complemented by the smaller Stellar, Stellar West and Shannon pits. The Water Tank Hill underground mine is a high-grade BIF hosted ore body and was accessed from the adjacent St George underground decline. Mining of Water Tank Hill has contributed low tonnage, high-grade ore. Subsequent production areas include the Shannon and Hill 60 undergrounds and the Eridanus and Morning Star open pits. The Checkers Gold Mill is a 1.9 million tonne per annum (Mtpa) conventional semi autogenous grinding (SAG) gold mill located approximately 4km from the Cosmos mining area. The mill has previously been operated at 2.4Mtpa and could be reconfigured if required. Ramelius total mill production from commencement to 30 June 2018 is 11.01 Mt at 1.83 g/t for 600,900 recovered ounces. Significant Resources and Reserves exist at Mt Magnet. For current detailed statements please refer to annual ASX release. Ramelius will continue evaluation, resource development and exploration of the field with the aim of adding to the Mt Magnet life of mine plan. The original ‘Mount Magnet’ that Austin climbed during his exploration activities in 1854 lies c. 60km east of Mt Magnet. It was later renamed Mount Carron. Mt Warramboo, located between the Checkers Mill and the Black Cat Administration offices was colloquially referred to as Mount Magnet. Gold in the Mt Magnet region was discovered in July 1891. Very rich alluvial finds were made over ‘Poverty Flats’ within the Mt Magnet leases. Largest nugget found over the years weighed 100 oz. A railway line linking Geraldton to Cue (via Mt Magnet) was completed in 1897. Discovery of gold along the Lennonville Trend was made in 1894 and over the next few years mines including Welcome Gold Mine and the Long Reef Gold Mine were operating. Mining of high grade ore shoots at the Morning Star mine also commenced in 1894. The St George Mine immediately west of the Mt Magnet townsite commenced operations in 1908. The State Battery (near Saturn pit) started operations in 1935. The Hill 50 mine, the largest of all the gold mines in the Mt Magnet district, began operations in 1934. Unlike most other gold mines it survived the Second World War. The mine continued operating during the war and in 1948 diamond drilling delineated the main high-grade shoot at depth. A new main shaft was sunk to 300m in 1950 and a steel head frame erected in 1956. A significant proportion of Hill 50’s total gold production came from mining of the ore body between the 3 Level and 6 Level (180-400m below surface), averaging a recovered grade of nearly 20 g/t gold. Hill 50 mine closed in 1976 and re-opened in 1981 when the gold price reached >$800/oz. The higher gold price during the 1980’s also saw several large open pits being developed, including the Mars and Saturn pits. When finally closed in 2007 the Hill 50 mine had reached a depth of over 1,500m below surface, making it the deepest gold mine in Australia at that time. Historically, the Mt Magnet district has produced c. 5.6Moz gold, with the Hill 50 Mine alone having contributed 2.1Moz. 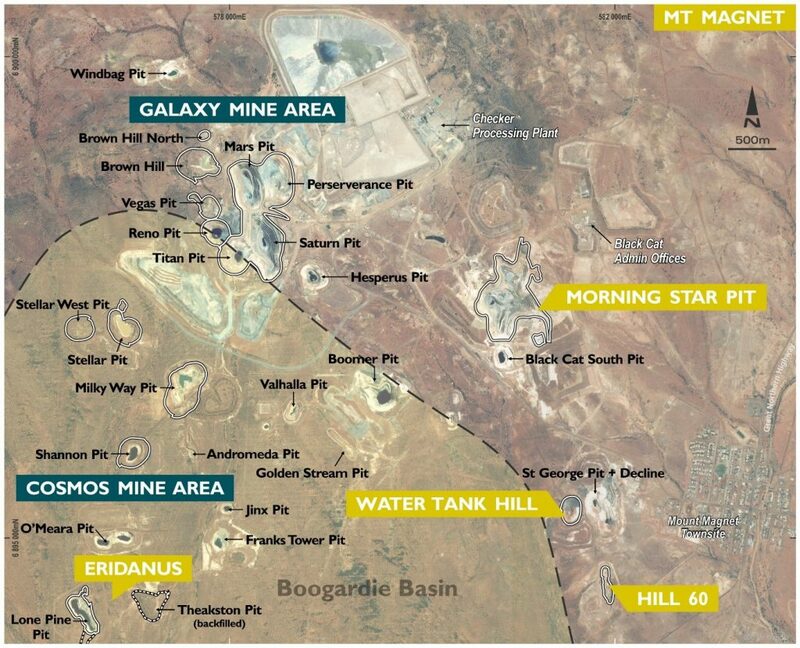 In 2010 Ramelius acquired the Mt Magnet gold project and recommenced open pit mining in 2011 with a reserve base of 545,000 oz.